Marcel Marx (Wilms), a former author and a well-known Bohemian, has retreated into a voluntary exile in the port city of Le Havre, where he feels he has reached a closer rapport with the people serving them in the occupation of the honourable, but not too profitable, of a shoe-shiner. He has buried his dreams of a literary breakthrough and lives happily within the triangle of his favourite bar, his work, and his wife Arletty (Outinen), when fate suddenly throws in his path an underage immigrant refugee from the darkest Africa. As Arletty at the same time gets seriously ill and is bedridden, Marcel once more has to rise against the cold wall of human indifference with his only weapon of innate optimism and the unwavering solidarity of the people of his quartier, but against him stands the whole blind machinery of the Western constitutionally governed state, this time represented by the dragnet of the police, moment by moment drawing closer around the refugee boy. It's time for Marcel to polish his shoes and reveal his teeth. Le Havre sees Finnish director Aki Kaurismäki (The Man Without a Past, Leningrad Cowboys) tackle the subject of Northern Europe's attitude to refugees from the developing world. His approach is dramatic, funny, heart-warming and, like his other work, beautifully offbeat. The film features fine performances from its cast that includes André Wilms (La Vie de Bohème), Jean-Pierre Darroussin (Red Lights) and the young Blondin Miguel. 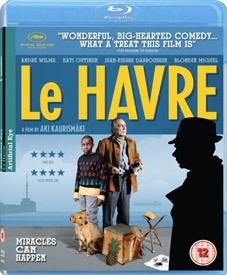 La Havre will be released on UK DVD and Blu-ray on 6th August 2012 from Artificial Eye at the RRP of £15.99 for the DVD and £19.99 for the Blu-ray. No extra features have yet beeen detailed, but we're expecting there to be something.